Apple's stock has been battered over the past year due to fears about iPhone unit sales growth. Yesterday's fiscal Q1 2016 results finally give us some data to understand how realistic these fears are. Apple reported iPhone shipments of 74.8 million units in the quarter, growing marginally over fiscal Q1 2015. However, Apple also increased iPhone channel inventory by 3.3 million over the quarter compared to a decline of 0.2 million in the same quarter last year. Keeping in mind that Apple reports sell-in (shipments), not sales to end users, this implies that iPhone sell-through actually declined by 4.3% YoY, from 74.7 million to 71.5 million units. This is the first such decline in the history of the product. In addition to this sell-through decline, Apple's revenue guidance for the next quarter implies a steeper YoY decline in unit sales. And finally, this was accompanied with a YoY increase in average selling price (ASP) which suggests that the iPhone mix is shifting towards higher end models. Since Apple's pricing is static, its growth and volumes will begin to slow (this long-term trend may be even sharper in the tablet market as the price-demand relationship is more natural, without carrier-driven distortions). While many of these predictions have materialized since (rapid low-end disruption of tablets, demise of subsidies, rise of low-end/regional vendors), I was definitely wrong to think that smartphones were "good enough" in 2013. Looking back, Apple's move to larger screen sizes was the single most significant sustaining improvement made to the product. My analysis was certainly mistimed in 2013. But does Apple's current predicament prove this hypothesis? Not quite. The fact is that the move to larger screens tapped into massive pent-up demand for the iPhone, leading to an upgrade cycle that was very difficult, if not impossible, to replicate. The iPhone's decline this fiscal year simply looks like the result of a tough compare. Of course, until very recently, some analysts assumed that last year's state of affairs was a sustainable trend. The less said about that, the better. While Apple's results do not validate my hypothesis, they do not invalidate it either. As Clay Christensen is fond of saying, "Disruption is a process, not an event". The mechanics of low-end disruption have been working ever since the first Android smartphone was unveiled in 2008. 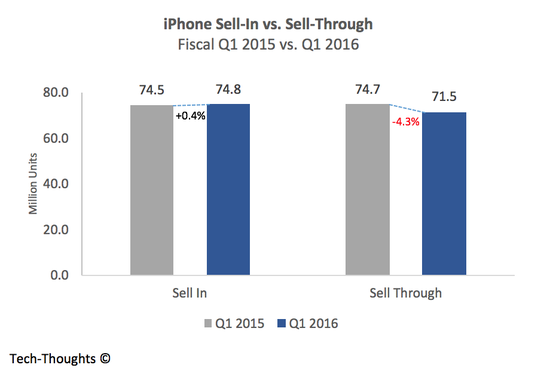 The key test for the iPhone will be the iPhone 7 cycle, starting in fiscal Q1 2017. In a "redesign year", it will be easier to gauge whether meaningful product improvements can continue to generate increased demand or if today's smartphones have already reached "good enough" territory.